Wealth inequality widened in Canada between 1999 and 2012, according to new data from Statistics Canada. Although all income groups saw at least some increase in wealth, the bottom 60 per cent of households saw their overall share of the country's wealth decline. And the wealth gap between the top 20 per cent and the bottom 20 per cent nearly doubled in that time. The highest earning 20 per cent of Canadian households saw their net worth grow by an average of 80 per cent between 1999 and 2012, to $1,300,100 from $721,900, StatsCan said. Net worth is defined as assets minus debt. The lowest earning 20 per cent of households saw their wealth grow by 38 per cent, to $109,300, on average, from $79,500. Thus the gap between the average wealth of the highest quintile of households and the lowest nearly doubled in that time, growing by 85 per cent to $1,190,000 in 2012, from a gap of $642,400 in 1999. 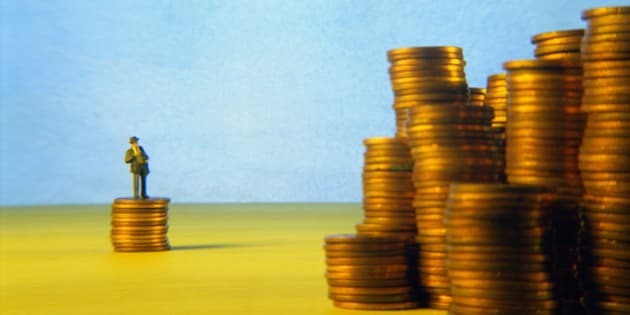 In percentage terms, middle-earning households nearly kept up with the highest-earning households; the middle 20 per cent saw their wealth grow by 73 per cent to $453,300 from $261,800. That's the same percentage as the overall average for all families. Only the top 40 per cent of households saw their share of Canada’s wealth grow, while the rest saw their share decrease. The top 20 per cent held 47 per cent of the wealth in 2012, up from 45 per cent in 1999. The bottom 20 per cent saw their wealth decrease to 4 per cent of all wealth, from 5 per cent. Real estate is becoming a larger and more important part of Canadians’ wealth, the StatsCan study found, especially among the lowest-income households. Among top-income families, real estate accounts for 40 per cent of all assets, up from 34 per cent in 1999. But among the bottom 20 per cent of earners, it accounts for 57 per cent, up from 46 per cent in 1999. There was little change in the numbers of Canada’s poorest households. StatsCan defined 3.5 per cent of households as being “low income, no wealth” in 2012, up slightly from 3.3 per cent in 1999. There are large differences in who belongs to this group, however. Among households whose primary earner is under 35, eight per cent are “low income, no wealth,” as is the same percentage of recent immigrants. Lone-parent families and those without a high school diploma also had elevated levels of poverty, StatsCan found.